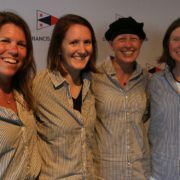 I come from a family that loves sailing, and have been lucky to be part of the St. Francis Yacht Club community my entire life. I spent summers at Tinsley learning to sail and windsurf, and although sometimes tears were involved, I came around and have fallen in love with water sports. 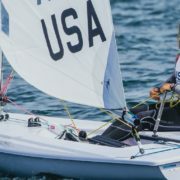 I jumped into a 29er with my dad, Paul Heineken, and in 2006 together we won the Woman Skipper division at the US Nationals. My brother, Johnny, was already an avid 29er sailor, so as a family we enjoyed traveling around the west coast and Canada to race. Aside from 29er racing, Johnny and I were learning to windsurf from our dad. Yes, for a year or so when people asked me what I was doing, I would regularly reply “swimming with a windsurfer,” but nonetheless, I finally picked it up and was out at Crissy Field flying around on most summer afternoons. From one high-performance sailboat to the next, change was inevitable. The first day I flew a kite I was hooked on kiteboarding. Since that day, I’ve been able to understand more and more how kiteboarding bridges the gap between so many sports I love. After I graduated from the University of Vermont, I was ecstatic to return to the Bay Area where the wind is consistent and the St. Francis Yacht Club is conveniently located just a few hundred yards from Crissy Field. It’s thrilling to be part of the Yacht Club and local kiteboarding community that pioneered kiteboard course racing. With the rest of my life, I work as a mechanical engineer for the City of San Francisco Water Department. It is a challenging job, in which I help plan and develop the infrastructure of our great City. Over the last two years, I’ve enjoyed competitive success. By developing my skills against the mostly male Crissy regulars, I’ve managed to do very well in fleets of women, winning the World Championship in 2012 and 2013. 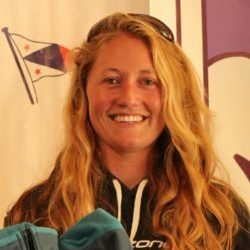 For my efforts, I’ve been recognized as a finalist for 2012 and 2013 Rolex US Yachtswoman of the Year, and the 2013 Rolex World Sailor of the Year awards.